Hey everyone, welcome to my little nook! This is the Birthday Hop for A Blog Named Hero, which is turning 2 already! Time to do a Happy dance! On this hop there are also prizes to be won. Thanks to our sponsors Hero Arts and Simon Says Stamp! You want to win? So make sure to leave a comment on all the blogs along this hop! I used the cute little robot from Hero Arts' Robot Trio. The cut file is also from Hero Arts, just like the sentiment. Do you see the little washi triangles? We ABNH girls are happy to play with some Freckled Fawn Goodies this month. I used this washi - it's adorable! I love this little robot, and what a fun and cheerful card. Beautiful card. Great rainbow background! Too, too cute! Thanks for the chance to win! I love this card! I think it´s adorable!! That is a really cute card. So super cute! Wonderful colors! What an adorable card!!! I love the rainbow backgroun and cute little robot! Super cute card! I love that background and that adorbs robot!!! Such a cute card! Love that rainbow piece with the cut triangles! Absolutely LOVE your card. The combination of the rainbow and the robot is just too cute for words. Fabulous card! Love those bright colors. Those robots need to be in my stamp stash (no, seriously.. I may have to buy these for my birthday on the 16th). Thanks for being a part of the blog hop. So super cute. Love the masked rainbow circle. I love anything with a rainbow colour scheme, and your robot is so cute! Love this cute card - your background is fabulous and yes, I love the washi triangles!! What a beautiful card... and guess what I have the stamp set... which I'm usually not that organized! Tks for sharing. This is a great birthday card for a little boy. Great job! What a fun card! Love those colors! What a cute, bright and fun card. I have grandsons who would love to receive that card! What a cute card! That little robot is adorable, I have a few nephews that they would be perfect for. Love the inspiration! Very colorful and eye catching! Like the cute robot birthday card. Like the colors. What a happy, colorful card. I loved it. Happy Birthday, ABNH! I'm new to the blog, but will be a regular visitor. Wonderful card. So bright and happy. Love it! Thanks. Love this card so fun and I love all the colors so fun! Love you're fun and colorful Birthday card. The robot is so cute. Thank you for sharing you're ideas with us. Oh your card is so bright and fun; I just adore your style! That card is perfect for a little to. Such a cute card! Love all the colors you used! love that rainbow star background! Such a fun card...I love it! Very clever way to use the washi tape, and I love your rainbow background! Cute... I like the rainbow background and the mini robot. Great card...love the creative use of washi and the starry background. Very cute card. Fun birthday card. Cute and adorable, my boys would love this. This is adorable and I like the colorful background. Thanks for the cute robot inspiration. Your use of washi is great! Such a lovely vivid background for the cute robot image, gorgeous inking!!! Your little robot is great! Wonderful card. A great card! Love the background and that adorable little robot! Great card. Love that robot and the colorful background. Great use of the washi tape! Love the watercoloured background on your , Christine. Love the robot with the cupcake! Great design and so festive. Oh this card is just too cute. Such a happy card. The rainbow colors are so beautiful!!! Such a cute card! I love how you've highlighted that darling robot with the bright, inky colors! So fun! So adorable! This is going to bring a huge smile to one lucky child! Absolutely love the rainbow background and the cute image! Wonderful card! Totally love this card, every inch of it. Makes me wish I had a machine to make the cut out, so so cute. Your colours are W O W.
I love the simplicitty and the colorfulness at the same time of this card. Thanks for the inspiration. So, so cute love this card and congrats on ABNH turning two. Thanks for sharing. So colorful and cute! Great hop so far! I love the bright background. Thanks for sharing. Ahhhh what a lovely card!!! Adorable! I love your bright distress ink circle. Beautiful! I love the background colors. Stunning card. I love the gorgeous distress background and your adorable robot. The little washi triangles are fab too. Your card is too much fun!! Love your little robot so cute love how you did the background gosh you really did a great creative job. Love what you did and the technique to it. Love...love...love!!! I love the colordul card. Great for a young boy or even young girl. beautiful card and I love the background you created for the robot. Cute, I had never noticed that one of the little robots is holding a cupcake! Everything about this card is awesome! Love the card. I'd love to make one like it for my grandson. Very nice. Love the colors you blended together. Great card! The colors and robot are super cute! Sweet and adorable!! Love the rainbow color background! 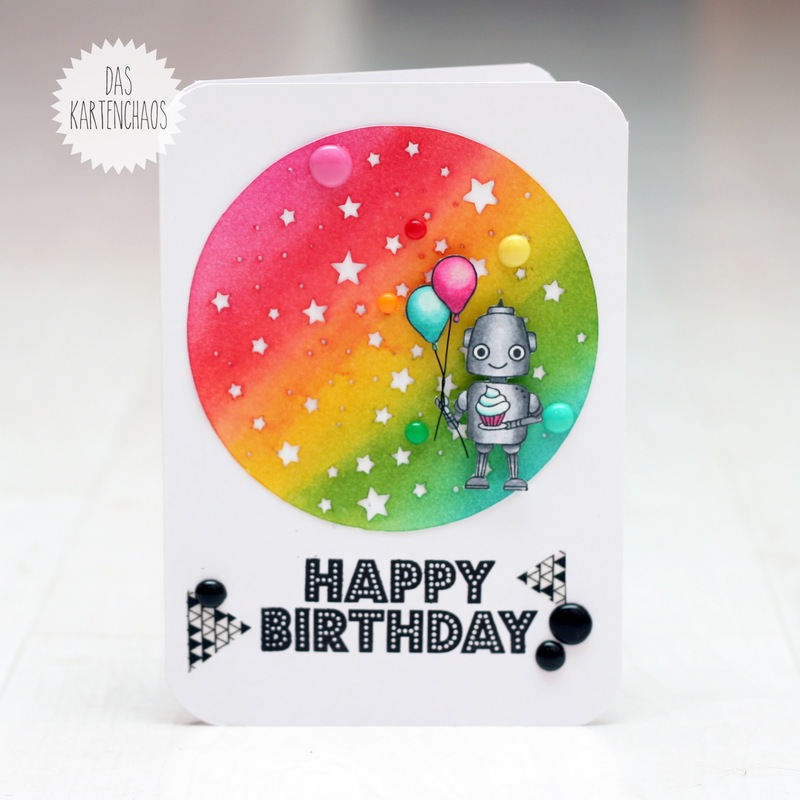 Love the rainbow on your card and the robot is adorable! Another cool use of washi! I love the cute little robot and the star background. Really cute. Was für ein Spaß hell und freundlich Karte. Vielen Dank für es! Such a cute card! I love the colors - they remind me of some of the colors you see from the photos that the Hubble sends back!!. What an adorable card! The robot is too cute! What a pretty background! I'd love to know how you did it! Beautifully done, love the background and the cute little robot! Very cute card! I like the use of the different colors for the background of your focal point. Such a cute card and love the robot!! The background circle is bright. What a fantastic and bright card! I love it! First time I see yourblog and I am already in love! nice card! Very fun card, so cute. Beautiful! I hadn't thought to make a triangle or arrow point out of washi, just using stripes. thanks for the fresh ideas. What a fun, bright card! Love it! Cute..cute card! Love the colors, and the robot is adorable! 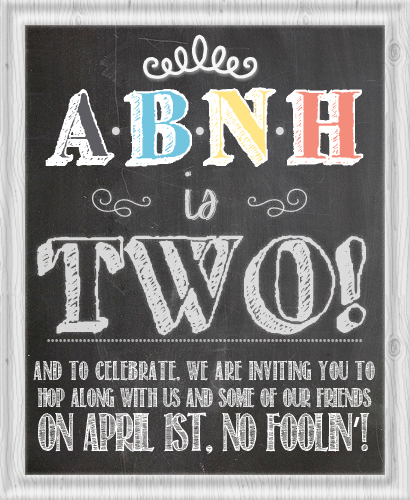 Thanks for sharing and Happy 2nd Birthday ABNH!! I love this card!! It is so fun and cute!! So fun ! I loved the multi-colored inked circle a lot ! Love the rainbow star circle. Love love love that little robot card! The colors are fantastic!! Thanks for being part of the HOP! What a cute little robot, and I love the rainbow background, looks awesome! Simply out of this world cute. Oh my goodness. This is super cute! Really cute card! Love the bright colors behind the robot! Great card. Thanks for sharing. Lovely colourful card - loving the little robot! Just TOOOO cute. This would be perfect for my grandsons birthday. Thanks for the inspiration! Love the rainbow background, really cute card. This card has Happy written all over it. It makes me smile! Wonderful card. The circle of stars in rainbow colors just grabs my attention. Super cute and colorful! I love it! Love your card! Love the little robot—he is both adorable and sweet! Great job! What a nice, fun and happy card. What a great card! Love the use of the washi tape! Oh that is a cute card! Thanks for sharing. Great watercolour background! So happy! Your card is so adorable, bright and cheery. Thanks for sharing. Love the bright background! Cute card! The stars on the round is such a great idea! The colors you used for the background are so vivid and bright. Love it! Love your card and the colour combo in the circle! Super cute card!! Love the stars and how colorful your card is!! Such a fun card. Love it! Wow, this is super cute! What a cute colorful card !! I love your style , I am happy to discover your blog. Love this! So bright and cheerful! TFS! That round stars stamp is definately going on my wish list! I just absolutely love this card...space, robots, and rainbows! Thanks for the inspiration! Your background is so amazing! Super, dass mal ein deutscher Blog vertreten ist! Beatutiful! Love the rainbow background!! I'm new to your Blog. I'm visiting for the Blog Hop for ABNH's 2nd BDay and I'm glad I stopped by. Your cards are different and I can't wait to view more of your Blog. Thank you. the rainbow watercolor background is gorgeous and I love how you made the wash tape triangles - amazing idea! Great hop too!! i love the cute robot on the bright background! AWESOME!!! Such a fun & bright card! I love the black & white with the watercolor background. So very pretty...love your color combos...and the background looks great! Such a cute colorful card! Love this cute colorful card! My nephews would love it! This is so super sweet! Love it!! lovely cute robot, the rainbow background with stars shines up the card ! awesome vibrant circle bg. TFS! love that rainbow circle-so cool! Oh I love a great rainbow effect!! Really, really cute! !